Professor Walter Mignolo (Duke University) is internationally renowned for his research into colonial histories and systems. This is a unique chance to hear the Argentine thinker discuss his new work, and what the terms ‘coloniality’ and ‘decoloniality’ mean to him. Responding to the talk will be artist Phoebe Boswell, who will also join Walter in conversation with curator Alanna Lockward. There will also be an opportunity for audience questions and contributions. Walter D. Mignolo is William H. Wannamaker Professor and Director of the Center for Global Studies and the Humanities at Duke University. He has been associated researcher at Universidad Andina Simón Bolívar, Quito, since 2002 and an honorary research associate for CISA (Center for Indian Studies in South Africa), Wits University at Johannesburg. Among his books are: The Darker Side of the Renaissance. Literacy, Territoriality and Colonization; and Delinking: The Rhetoric of Modernity, the Logic of Coloniality and the Grammar of Decoloniality. Alanna Lockward is a Dominican-German writer, journalist, filmmaker and founding director of Art Labour Archives, an exceptional platform centred on theory, political activism and art. Lockward has conceptualized and curated the ground-breaking transdisciplinary meeting BE.BOP. BLACK EUROPE BODY POLITICS (2012–2018). Her interests are Caribbean marronage discursive and mystical legacies in time-based practices, critical race theory, decolonial aesthetics/aesthesis, Black feminism and womanist ethics. She is currently adjunct professor at the Pontificia Universidad Católica Madre y Maestra (PUCMM). Phoebe Boswell is a multimedia artist who lives and works in London. Born in Nairobi to a Kikuyu mother and British Kenyan father, and brought up in the Arabian Gulf, she combines traditional draftswomanship and digital technologies to create layered works anchored to an inbetween state of diasporic consciousness. Boswell studied Painting at the Slade School of Art and 2D Animation at Central St Martins, and her work has been exhibited with galleries including Carroll / Fletcher, Kristin Hjellegjerde, InIVA and Tiwani Contemporary and has screened at Sundance, the London Film Festival, LA Film Festival, Blackstar and CinemAfrica amongst others. She participated in the Gothenburg International Biennial of Contemporary Art 2015 and was commissioned to make new work for the Biennial of Moving Images 2016 at the Centre d'Art Contemporain in Geneva. Boswell was the first recipient of the Sky Academy Arts Scholarship, was awarded the Special Prize at the Future Generation Art Prize for her interactive installation Mutumia, which consequently showed as part of the 57th Venice Biennale. She is currently a Somerset House artist-in-residence, a Ford Foundation Fellow, and is represented in the US by Sapar Contemporary, New York. Be.Bop 2018 Black Europe Body Politics. 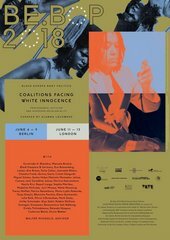 COALITIONS FACING WHITE INNOCENCE is a project of Art Labour Archives in cooperation with Studio Я / Maxim Gorki Theater and Autograph ABP, curated by Alanna Lockward. Supported by Bundeszentrale für politische Bildung/bpb and ifa-Galerie Berlin (Institut für Auslandsbeziehungen) with friendly support by Danish Arts Foundation, Savvy Contemporary, American Studies Program – Humboldt University Berlin, London College of Communication: University of the Arts London, King’s College London, and Tate. This event has been provided by Tate Gallery on behalf of Tate Enterprises LTD​​​.